Why are U.S. Taxpayers Supporting Numerous Duplications of Effort in the US Global Change Research Program (USGCRP)? | Watts Up With That? According to the 2014 Climate Change Expenditures Report from The White House, costs to U.S. taxpayers of the US Global Change Research Program (USGCRP) run about $2.5 billion annually. None of the models used by IPCC are initialized to the observed state and none of the climate states in the models correspond even remotely to the current observed climate. In particular, the state of the oceans, sea ice, and soil moisture has no relationship to the observed state at any recent time in any of the IPCC models. There is neither an El Niño sequence nor any Pacific Decadal Oscillation that replicates the recent past; yet these are critical modes of variability that affect Pacific rim countries and beyond. The Atlantic Multidecadal Oscillation, that may depend on the thermohaline circulation and thus ocean currents in the Atlantic, is not set up to match today’s state, but it is a critical component of the Atlantic hurricanes and it undoubtedly affects forecasts for the next decade from Brazil to Europe. Moreover, the starting climate state in several of the models may depart significantly from the real climate owing to model errors. I postulate that regional climate change is impossible to deal with properly unless the models are initialized. U.S. taxpayers are paying for 17 climate models from 5 climate-modeling groups—and the resulting model-based studies—even though those climate models are simulating fantasy climates, not climate as it exists on this planet. Keep in mind there are more than a dozen other modeling groups around the globe and many models share computer code, which means they are not independent of one another. Why do U.S. taxpayers pay for 17 models of fantasy climate? For this discussion, we’ll define climate model-based studies as scientific research of Earth’s climate and the long-term impacts of manmade greenhouse gases on climate, on flora and fauna and on human health and wellbeing that are based solely on the outputs of climate models. Those studies can rely on the outputs of selected (cherry-picked) models that meet the researchers’ needs. Others studies can rely on the outputs of the full ensemble of models stored in a CMIP archive. For yet even other studies, the models are specially programmed for a specific variable, output and result. We discussed above that climate models are not simulating climate as it exists on Earth. Yet each year U.S. taxpayers pay for hundreds of research studies of fictional model-based climate. Climate model-based studies are conjectural at best, misleading at other times. Why do we keep pumping U.S. taxpayer dollars into science fiction? Both NASA’s Goddard Institute of Space Studies (GISS) and NOAA’s National Centers for Environmental Information (NCEI) manufacture global surface temperature anomaly products. (GISS data here and NCEI data here.) Both use the much-adjusted data from NOAA/NCEI: GHCN.v3 near-land surface temperature data and ERSST.v4 sea surface temperature data, the latter of which is NOAA’s “pause-buster” data (see the posts here and here for discussions of the curiosities in the NOAA’s ERSST.v4 sea surface temperature dataset). GISS also includes the Antarctic surface temperature data from The Scientific Committee on Antarctic Research (SCAR) to better capture the surface temperatures of that ice-covered continent, which represents less than 3% of the surface area of the globe. 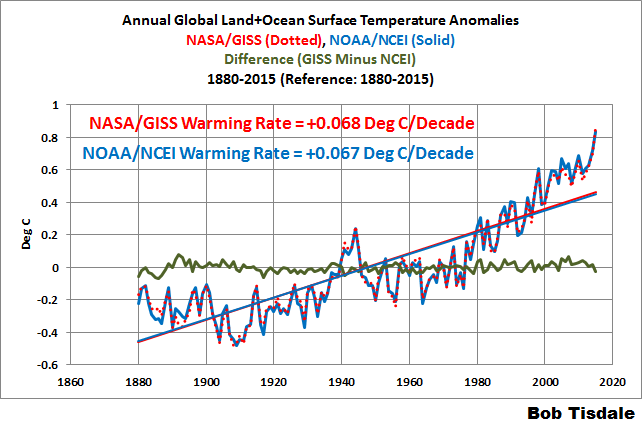 Figure 1 compares the annual global land+ocean surface temperature anomalies for the full terms of data from both suppliers, along with their difference and their linear trends. You’ll note that I’ve used the full terms of the data (1880 to 2015) as the reference period for anomalies. That was done so that the base years didn’t skew the curve of the difference. how the suppliers handle the surface temperatures above sea ice in the polar oceans. Even so, there are only minor differences in the annual wiggles. The correlation between the two datasets is almost perfect at 0.996. The UK Met Office (webpage here), the Japan Meteorological Agency (webpage here), the privately funded Berkeley Earth (webpage here), and a privately funded, modified version of the UKMO HADCRUT4 data from the University of York (webpage here) also produce global surface temperature products so there are numerous other sources of similar information for research and verification purposes. Why do U.S. taxpayers pay for two global surface temperature products that furnish the same information and are based on the same source data from NOAA? NOTE: The U.S. also produces two satellite-derived atmospheric temperature datasets, one from Remote Sensing Systems and the other from the University of Alabama at Huntsville. No other countries produce similar datasets so there are no additional sources of the same information. Therefore, they are both required for research and verification purposes. 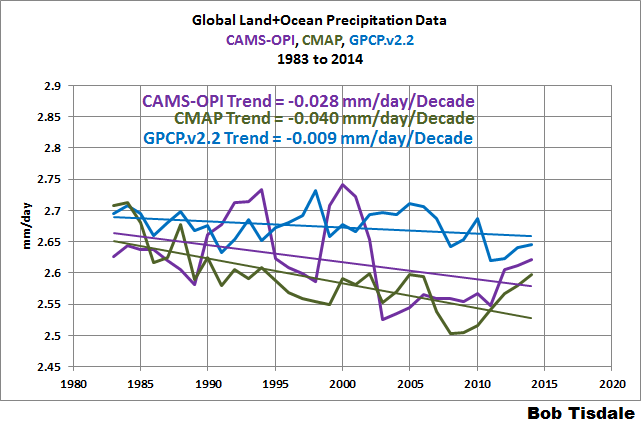 Figure 2 compares the annual global precipitation values from those three datasets for the period of 1983 to 2014. The data are presented in absolute form, not anomalies. Unlike global surface temperature datasets, there is little agreement among the global precipitation datasets. They all show declining global precipitation over the satellite era, but the rates at which they decline are noticeably different. Annual variations show few agreements. That is, the three datasets correlate very poorly. Keep that in mind the next time you hear of a consensus on climate change. Do U.S. taxpayers need to support 3 global precipitation datasets, especially when they show the climate science community has a very limited understanding of how precipitation varies around the globe? The sea ice products can vary between research centers: some produce sea ice extent data, others produce sea ice area data, while others produce sea ice volume data. But there are numerous duplications of effort. Do taxpayers really need to pay for 5 research centers, all studying polar sea ice? Pick a climate-related variable. There are numerous datasets of that metric. And when data from direct measurements do not exist, there are multiple modeling groups attempting to simulate it with special models called reanalyses. For further insights into how poorly climate models simulate Earth’s climate, see the series of posts titled Climate Models are NOT Simulating Earth’s Climate. There are numerous other discussions about climate model flaws in my free ebook On Global Warming and the Illusion of Control – Part 1 (700+page, 25MB .pdf). March 29, 2016 in Politics. marcus, I haven’t the slightest idea why all of those “related posts” appeared. But thanks back atcha for the preliminary kind words. It is important to call attention to USGCRP’s declared intention under its 2012-2021 plan to advance Science by integrating “natural and human components.” http://www.invisibleserfscollar.com/if-reality-is-ignored-or-disregarded-when-do-we-become-a-state-against-its-people/ This is code for using education and the behavioral sciences to create useful ‘guiding fictions’ that support planning and social engineering by public policy. It fits also with what the National Science Foundation and the NIH are pushing in an initiative called the BRAIN Institute. The purpose of the models is not to reflect reality. the purpose of the models is to create and guide beliefs that enable politicians to insist that reality be altered by political edict. Precisely what we are seeing the UN, IPCC, and the US embark on. ..Must be because your posts are so popular Bob !! Neuropsychological engineering for a collectivist political purpose. Seems Word Press is harder to understand than climate! We need Proxmire’s Golden Fleece Award. Why? Because a “gravy train” has many cars. Your right Rocky, it’s stirring the grant train money puddle = lots of too stupid taxpayers money to go around! If we had only one source for each, we might make the mistake of thinking it credible. I’m reminded of how Congress dealt with the 1970s toxic waste crisis (Love Canal, etc.). Congress ordered the EPA to generate a list of at least 400 “national priority” sites with a minimum of one per state to be listed amongst the “top 100” cleanup targets. In other words, Congress sees every crisis as an opportunity to send federal dollars to local projects, regardless of relative merit. Thus shall it ever be. I’m sure it’s even worse than Bob demonstrated. For example, we have the STAR satellite data from NOAA and MASIE sea ice data from NSIDC (which likely takes added funding). Simple answer to the post question: Because every rent-seeking agency wants to get their feed at the public-money trough. They’re entitled to it, ya know? …and every rent-seeking university in the US wants the same. I doubt you can find one that doesn’t have its snout in that trough. State is the key word. Climate state varies as with weather, and weather is what he is talking about, on timescales up to ENSO or PDO (his examples). This is a familiar issue with fluid dynamics. A flow over a wing, say, is unsteady, with turbulence at various scales. But no-one measures the initial state of the flow, or even the time-varying behaviour of oncoming eddies. It’s all averaged. And you get averaged results – as in mean lift or drag. That’s what designers work with, whether in lab or CFD. A transient CFD computation will show all sorts of “fantasy” eddies etc. They are there in the wind tunnel too. You have to have them – they are part of the physics, and affect momentum transport etc. But you derive quantities that are independent of them, after averaging. And those are then applicable to a real wing. Climate is the analogue of mean lift, drag etc. Averaging is the key. And Trenberth is emphasising that on a regional scale, there is less averaging, and so the results are less reliable for a given time. Trenberth’s article was timely – starting with Meehl and others about 2008, there has indeed been a Decadal Prediction Project, which does try to initialise the state. As the linked article emphasises, it is a work in progress. But it does seek to solve Trenberth’s issue of regional reliability as well. As to duplication, there has always been lots of that in science. It’s how we keep on track. ..LOL, clutching at straws as you drown in your own idiocy ! Seriously, good luck as a high school freshman, next year. It is a very obvious interpretation of what Trenberth said. More fine, super-well-informed, reporting, Bob! And the answer is: NO. Duplication of effort is a waste of the taxpayers’ money. That Walt the P.’s (below) basic premise is correct, that multiple analyses of the same data are a good thing, does NOT = government should fund such analyses. I was in Boulder at the time (12 Oct 2009) and remember the kerfuffle around that time well (great back and forth in the area papers). This was about the time I started paying attention and figuring out that I was being lied to about CAGW. This is a familiar issue with fluid dynamics. A flow over a wing, say, is unsteady, with turbulence at various scales. But no-one measures the initial state of the flow, or even the time-varying behaviour of oncoming eddies. It’s all averaged. And you get averaged results . That’s far beyond the ability of that clim mods. With an aircraft you have the real representation in 3d to the millimeter. And you have the specificatons of all materials used. So you can simulate the reaction of say a wing to every wind shear. only in dreams will those climate models ever reach those capacaty. A yes, brute force – superComputers. not in all our line time. There’s nothing wrong with duplicating research when it is done by the competent people who are capable of productive discourse and who are interested in obtaining results rather than their little careers and tenured incomes. In this case duplication creates healthy competition. However, current state of science is such that it became feeding grounds for incompetent and politically savvy individuals. Besides climate modeling, it includes practically all physics research and, by induction, I would assume that, the rest of the sciences are in the same state. It is not competition, it is validation and repeatability. There should be a follow up exercise identifying why X got one result and Z got another, with the hope of both sides learning something and coming to agreement on how to produce a better model. The aim surely is to produce one that does correctly forecast what the climate will do. This is the claim made by the funding politicians after all. If they do not work together to find out why there is a difference and publish the results then the only assumption is that continued funding will result in a plethora of useless unvalidated models – which is precisely what we are seeing. We like throwing money away, that’s why. It’s our money, and besides, we’re rich, doncha know. We need multiple troughs for so many pigs. To the Trenberth quote, it occurs to me that the only model to remotely approximate temps is the one run in Russia. It sure would be interesting if the initial state of that was published. I get no sense from the way these organizations behave that there is any penalty for being consistently wrong, or any incentive to get it right. Simple. Because our government is run by incompetent crooks who will spend every penny they get and then borrow another half trillion or so on top of that. Some people say the Washington Redskins should remove the word Redskins from their name because it is offensive to Indians. Here is a better idea; leave Redskins in and delete Washington because it is associated with incompetence and corruption and sets a bad example for young people. National debt = $19 trillion and counting. 19 Trillion does not include the unfunded debt ! $ 127 Trillion in unfunded debt as per Forbes..
Abraham Lincoln once said of the Federal Government “There are too many pigs for the teats”, but we have now solved that problem by creating an endless supply of Government funded teats. The simple answer is that they want to to control the outcome, and thus they both employ large numbers of potential competitors this way as well as the overwhelm contrary findings by quantity. First rule of a government project, why build one when you can build two for twice the price! Good question. I suppose the concise answer is that taxpayers have not complained about paying for duplicate programs before so our lords and masters will continue running them all. No cabinet level bureaucrat wants to let go of his or her program even if there is another with the same mission over in another cabinet level department–it is a corollary of Parkinson’s Law. It is important to have as many apparently independent sources repeating the same line, in order to improve plausibility. Exactly – if everybody repeats the same thing, it looks like a lot of corroborating evidence. You can run the same model, for example, and play its effect out on everything from sea-levels to tree frogs – you can get three, four, five weeks of scare stories off of a single ‘study’ – and then reference it for six months or a year in political speeches. Just another example of Goebbels’ methods at work. With all due respect–and I have a lot for your extraordinary posts on ENSO, and your books explaining it to a layman like me–but federal taxes do not pay for anything. Payers of federal taxes pay for zip. This is a lazy convenient lie that people tell themselves and repeat because they haven’t done their homework, because they believe that the the US federal government is no different than a business or household, or state or local government. It’s not. The US federal government is not run like a business. It is not revenue-constrained. It creates its own currency. In fact, it is the monopoly-supplier of USD worldwide, otherwise someone is counterfeiting them. Yes, payers of State and Local taxes do pay for services, but not federal taxpayers. Here is the proof: the Daily Treasury Statement, which is the US federal government’s checkbook, and the most complete financial record of how the federal government spends the nation’s dough on a daily basis . . . after it has created that dough, that is. Please note Table III-A (pg 2 of 2). In 2015, the US federal government created (issued) $60,775,423,000,000 in USD, or $60.8 trillion. Please note Table IV (also, pg 2 of 2). Total federal taxes paid in 2015: $2,789,779,000,000, or $2.8 trillion. $2.8 trillion did not pay for $60.8 trillion worth of federal government expenditures, which was what the federal government created—per the US Constitution—to provision itself (salaries, buildings, maintenance, social security, medicare, military, 238 years of congressional appropriations that still apply in 2015, foreign aid, etc). This ‘my federal taxes pay for X’ lie is as bad as the CO2 argument. It’s wrong. And it falsifies the basis of our prosperity, which we haven’t even begun to realize since Nixon wisely took us off the international gold standard in 1971 because we refuse to recognize, or acknowledge, how our federal monetary system works. ..Are you really that S.T.U.P.I.D or are you just practicing to be a liberal politician ? Taxpayers pay for it in the end ..PERIOD ! Marcus, you need to tone it down. A couple of your comments have already been deleted due to them containing some pretty ugly statements. You’ve been warned previously that the sort of comments you have been leaving violation the site policy. This will be your last warning. Shape up or be shipped out. Marcus!!! DO not get “shipped out,” okay? Your enthusiasm is a DELIGHT (and yes, I can see that we need to be careful to remember that this is, essentially, Anthony’s living room and respect his rules). You have no clue what you are talking about. Examine the data, although I admit it’s complicated until you get a handle on it. There is an enormous difference between how the federal government and the non-federal government (business, households, state/local government, foreign sector) operates when it comes to the USD. Hi, Marcus. I don’t think your smilies look like that. What are you talking about? lol Try not winking, like this, 😉 … and just doing a straight … 🙂 smile. That’s all I can think of (shrug). It’s really very simple. The US Treasury’s Daily Treasury Statement DOES NOT include ” Unfunded liabilities ” …as per Obama’s ” adjustments ” to reporting…Kinda like the ” unemployment numbers “.. , which don’t include Americans that stopped looking for work !! If you torture the data long enough, it will confess to anything ! Specifically, what “unfunded liabilities” are those? Name them. Payers of federal taxes pay for zip. Really? So I can stop filing my Form 1040s and keep the money for my own purposes as, based on your comments, you presumably must be doing? So where does the $1.9 trillion in Federal income taxes in fiscal 2016 actually go? To other players in a Monopoly game? Great questions. But I’m afraid the answers are so arcane you’re going to want to bash my head against the wall. However, understanding that the federal government does not need revenue to provision itself is the key to wrapping your head around this. When Congress ‘appropriates’ or spends, no one calls the IRS and asks how much money we have in the kitty. All new money that the USG creates—via these Congressional appropriations—is brand-new interest-free into the real economy, and has nothing to do with taxes collected after the fact. We’ve had a fiat currency since 1933, which is by definition a coercive system and leads to the phrase “the full faith and credit of the United States.”. No one would work for the USD if they didn’t have to pay taxes and be subject to severe penalties for not doing it. There would be no unemployment because people would have individual means of providing for themselves and their families in the jungle that would otherwise exist. In modern economies, taxes control and maintain the value of the currency, and it is supposed to stabilize the economy, just as the massive war spending from 1939-1945 stabilized the US economy then and created the middle class. When the economy is in the tank in a capitalistic system such as ours, Congress needs to cut taxes and increase federal spending—give people jobs—to increase the flow of USD into the economy. (One USD of federal spending usually creates $3-4 of new wealth in the private sector—I think that’s the ratio). When it’s running red hot, Congress needs to increase taxes and cut spending to reduce the flow of USD in the economy to maintain price stability and and keep inflation at bay. This is from the macroeconomic (federal government) point-of-view, RalphDaveWestfall. Not the microeconomic, or private sector, or non-federal government, point-of-view. Knowing the difference between the two points-of-view is vital. One example is the word “Debt.” ‘Debt’ is a contronym. When you’re talking about the federal government, debt means new money creation; it’s the nation’s equity—yes, created out of ‘thin air’ for the general welfare of the People, as the Constitution says in the Preamble. When you’re talking the non-federal government use of the USD, debt is real go**am debt: you gotta put up collateral, pay interest, and pay it back. . . .but it all nets to zero across the micro level. Only federal government spending increases the net financial assets to the American people. So where does the $1.9 trillion in Federal income taxes in fiscal 2016 actually go? Technically, they’re “extinguished.” Everything is extinguished when it’s returned to its Creator. And the reduction of currency (national ‘unit of account’) available to the real economy actually increases the value of that currency, or maintains it, because there’s less of it in the real economy. Someone got really pi**ed at me when I was trying to explain this and said, “Oh yeah? Then if what you’re saying it true, the federal government can give me and everyone in the US a trillion dollars each, right?” I said, “Yes, technically it could.” But that would mean the price of your house would be anywhere from a trillion (shack) to $50 trillion (McMansion) and the price of a cauliflower around $400 million, but no one could afford to visit the US or trade with us. Etcetera. the federal government can give me and everyone in the US a trillion dollars each, right? I said, ‘Yes, technically it could.’ But that would mean the price of your house would be anywhere from a trillion (shack) to $50 trillion (McMansion) and the price of a cauliflower around $400 million, but no one could afford to visit the US or trade with us. Cutting through the volume of your reply, you are admitting that our taxes are necessary to prevent wild inflation. So your claim that “Payers of federal taxes pay for zip” is misleading at best. If one looks at the TOTAL budget for climate change from your reference: (https://www.whitehouse.gov/sites/default/files/omb/assets/legislative_reports/fcce-report-to-congress.pdf ) the US Government spends approximately $ 20 Billion every year, year after year, for the total climate change effort including Research. Add that up over 20 years and it is approaching 1/2 trillion dollars. Again the duplication of effort is significant in the bio-fuels and other alternative energy subsidies. As one who once followed the biofuels “business” closely and consulted on duplicate efforts it is clear that there is considerable overlap. Also it is clear that a significant amount of the funding is spent on going to Conferences rather than development of alternative fuels. Either those rewarding the subsidies are not qualified to judge the merits of the proposal or they don’t care if the proposal is different that all the other subsidized activities. We need to have the Patent office skills to root out duplication’s or repeating the same failures again and again. It seems as though the agenda is to get as many individuals supporting the effort as possible rather than make sure the efforts are productive. The lack of results and numerous failures tell the story. Because Washington is run by Lawyers who know little about Science or Economics. Two competing agencies will do very well in an administration where one would be found unnecessary. I don’t mind the duplication of effort. What bothers me is that these efforts aren’t in service to opposite points-of-view, or hypotheses, something that Colorado scientist Bill Grey advocates and which I agree with. An ideological driven administration, as Obama’s is, would never allow allow the search for truth to interfere with it’s political agenda. No s**t, GTL. Obama is so clueless about how the federal monetary system works, and so is his Clinton-era Treasury Secretary (a fellow lawyer who was instrumental in creating the Global Financial Crisis, btw, when he created the Balanced Budget Act of 1996 or 97), that he (O.) actually proclaimed a few years ago–2009? 2010?–that the US is broke, and that we’re running out of money. Effing Facepalm! You can add all the other Clinton-era yokels in there as well: Larry Summer, Geithner, all of them. We could have been out of the Great Recession within a year if they knew what they were doing. Yes they are all necessary. Having multiple groups trying different methods and data gives you insight into structural uncertainty. With some data, like satellites, structural uncertainty is huge and dominates. For the record Giss data requires 1/4 of a man year. Given these are the groups that claim the science is settled why do they need larger budgets now than when the science was not settled? Steven you are badly mistaken when it comes to alternative fuels, I know I have consulted in that industry on numerous failed projects, yet they keep failing to meet the cellulosic requirements for auto fuels by a wide margin. 50 people cannot get more blood out of a stone than one. Also I look at the numerous spaghetti plots all giving different answers, Those models don’t come cheap! Just proves thy are nonsense. Tell me what accomplishments we have to show for a half trillion dollars from government spending for useful alternative liquid fuels. Do you need the list of failed subsidized projects like Range Fuels? Funny all these multiple groups haven’t been able to figure out what is wrong. A red team might help your structure business, moshe, rather than multiple construction gangs erecting the same structures on unstable foundations. Moshe lives in his own little green bubble ! The question in the subject is easily answered by realizing we have yet to spend all the money of all our unborn future generations. Only when that has occurred will responsible budgeting return. Only when that has occurred will responsible budgeting return. Geez, I wish I had you optimism… about the return of responsible budgeting, ever. Apparently we need one or two more as no one, as yet, gets it right. ..Well, when Anthony W. or Bob T. get nominated as Science Advisor for Cruz or Trump, it will definitely be the last one ! Because there’s no controlling authority and the subject’s a pig-feeding trough? I mean NO insult to pigs. I love pigs. Another example of mis-guided spending of tax dollars with foolish projects in the name of claiming CO 2 is a pollutant. After years of delays, clean coal plant still not operational. Duplication of failures. It is also turning into a lesson in just how hard survival is likely to be. As clean-coal projects go, Kemper — even with its delays and cost overruns — practically counts as a success story. Another high-profile test case for the technology — FutureGen 2.0 in central Illinois — died three months ago after its federal subsidies evaporated. Two more major federally funded demonstration projects in California and Texas are also imperiled. “Unknown to most climate laypersons, climate models are not simulating Earth’s climate as it existed in the past, as it exists now, or as it might exist in the future. ” Amen. If models can’t replicate the past & current climatological structure of stationary ridges and troughs, then how could does one confidently distinguish projected responses from parameterized CO2 forcing versus amplified errors? Ignoring this shows bias, IMO. The purpose of concurrent multiple redundant efforts is to search stochastically for a single result, the atypical 1% statistical outlier, which can be adopted to the exclusion of all others and which might provide a convincingly persuasive result, uniquely different from the others that have gone before, that will convince all comers overwhelmingly that the alarmist agenda is justified. This is a sort of shotgun approach to scientific research. This amounts to doing one thing many different times and expecting a different result. There is a term for such endeavors – “insanity”. The situation regarding these wrong model simulations is worse then described. The government has to borrow the money to support these useless efforts. I estimate that the money the federal government is borrowing today will end up costing the tax payers more than 12 times the money borrowed to repay it over the next 170 years. If we look at Figure 1 and Figure 2, after 1985, they present opposite pattern. That is decreasing rainfall increases temperature — drough years increase the temperature. That means the increase in temperature after 1985 is not associated with global warming — anthropogenic greenhouse gases. Secondly, do we have accurate rainfall data covering all climate systems? But, there is only one Farmers Almanac! Strictly speaking, there is no “Farmers Almanac.” There are, however, the “Farmers’ Almanac” (1818) and the “Old Farmer’s Almanac” (1792), competing publications.